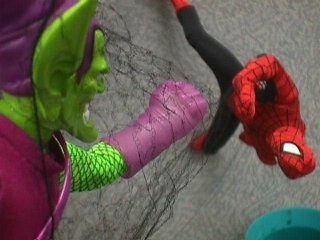 Spider-Man and the Green Goblin! A desperate aerial battle is being played out over my desk here at work. 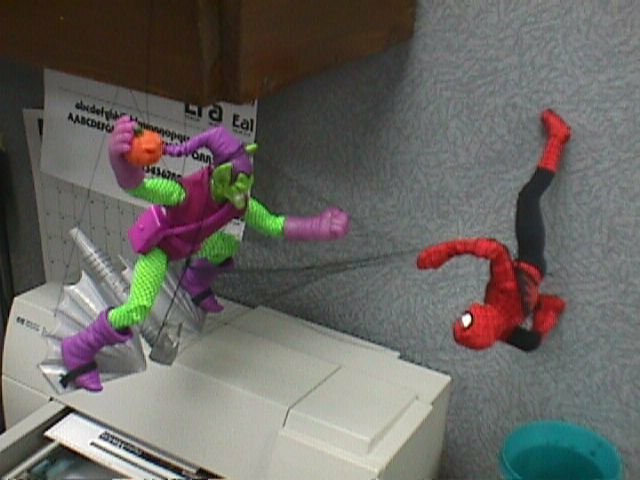 As you can see, the villainous Green Goblin is attacking the Amazing Spider-Man. 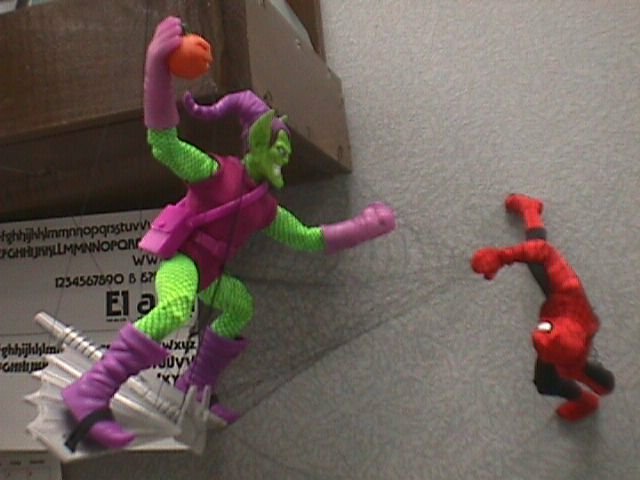 The Web-Slinger would seem to have matters well in hand as he fires his web-shooter, catching the Goblin in a steel-hard, sticky web. But, with his free right hand, the Goblin seems to be about to throw a deadly Pumpkin Bomb! 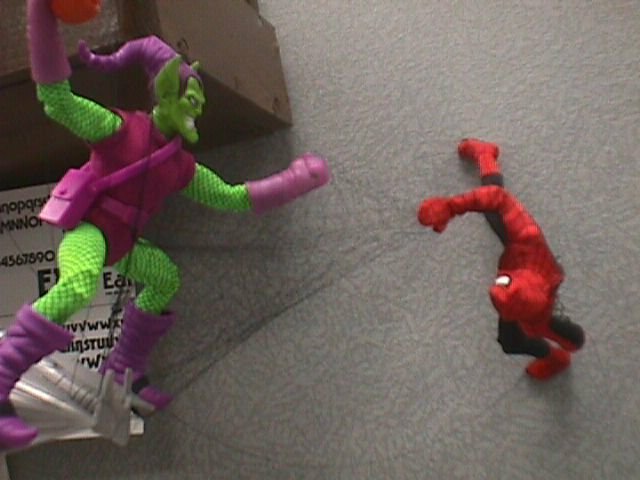 Spidey and the Goblin here are both ftom Toy Biz's "Famous Covers" line. The only bit of customization I've done is to sew Velcro pads to the soles of Spider-man's feet. A nice little detail that is very difficult to see in these pictures is the web-line held in Spidey's _left_ hand. It's a piece of common sewing thread, passing through his gloved fist, and curling up to attach to the bottom of the wooden ledge behind the goblin. It helps give the impression that Spider-Man has just swung up to get ahead of Gobby. The Web in which he's ensnaring the goblin is of course a common hair net. This one specifically is a "Goody" hairnet, item #00060 in black. It came in a package of three from Wal-Mart for $0.97. It's nylon with elastic edge. It's not affixed to his glove in any way, I've simply stuck his hand through a single-strand loop.